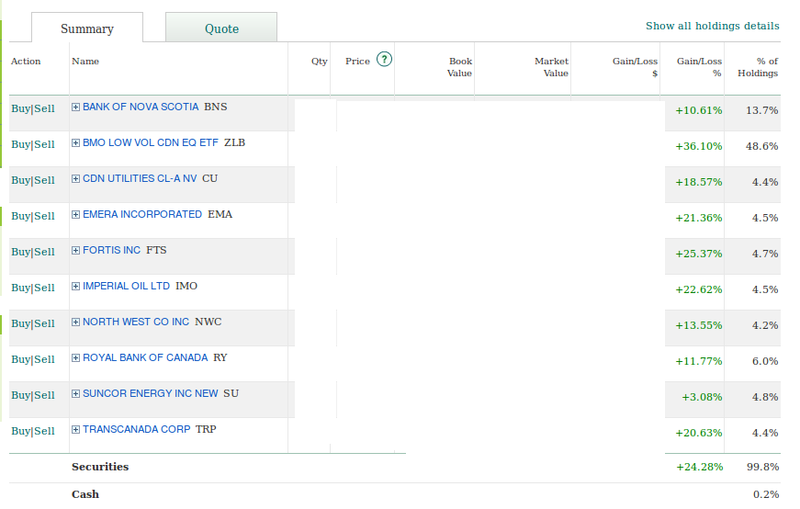 Michael James' tongue in cheek The Stock Picker's Checklist prompted me to look at one of my accounts at TD where I have bought individual stocks as part of my overall Canadian equity allocation. On first glance, the screenshot below of my account return against the TSX Composite Index Total Return (which is the appropriate benchmark since the account is entirely Canadian equity holdings and all the stocks, and the holdings of the one ETF, are part of the TSX Composite) makes me look like a rival to Warren Buffett and Charlie Munger. ... but the sudden divergence of the lines around September 2014 made me look a bit closer and the source of the marked difference is the sole ETF in this account, BMO's Low Volatility Canadian Equity fund (TSX: ZLB). ZLB contains much less weight in energy and materials by virtue of its criteria to select low volatility stocks. 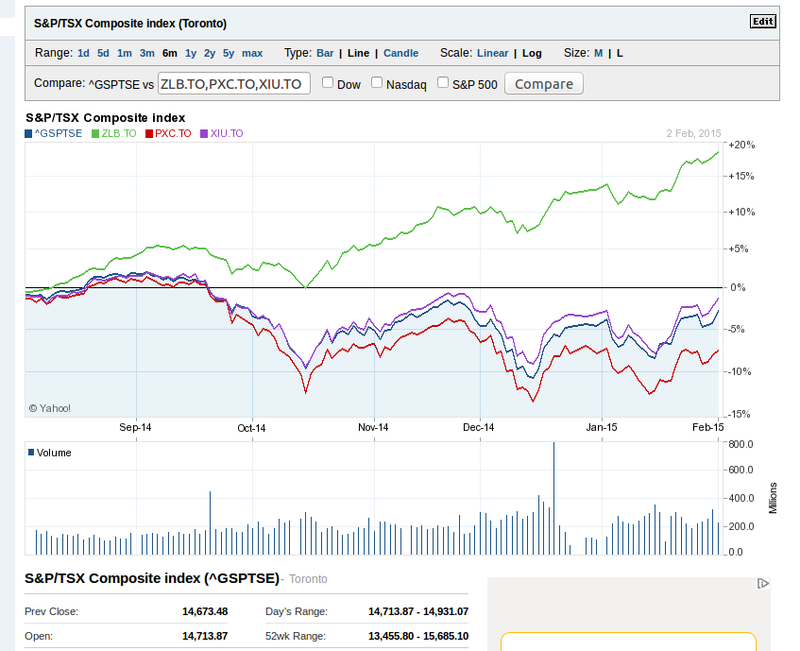 The following chart from Yahoo Finance shows ZLB against the TSX Composite and a couple of other ETFs - iShares' XIU, which tracks the TSX 60, and Powershares' PXC, which is a fundamentally-weighted Canadian equity fund. PXC has closely tracked the pattern of the TSX while doing appreciably worse. Meanwhile ZLB works completely differently. The TD account balance screenshot (edited to remove dollar amounts of my holdings, which unfortunately are nowhere near rivalling those of Buffett and Munger) confirms this. ZLB is about half the holdings and its gain is far ahead of anything else. Its return has dominated the account. 1) My stock picks so far have been doing about the same - no better but no worse either - than their benchmark. Not much benefit or harm either way. 2) ZLB's low correlation with PXC and the TSX Composite indicates that a portfolio built to include non-cap-weight components (like the Smart Beta described here on my other blog) makes sense. The last three years, market conditions have been such that ZLB is powering ahead. At some point, it will be PXC's turn. All along my portfolio is more stable / less volatile. It's hard to tell too much about ZLB's returns and correlations over such a short period. We'll learn more over time. I couldn't tell what time period you used for your own stock picks, but I encourage you to check it annually. I hid for years behind total returns that were juiced by good early returns. Hi Michael, We will indeed learn more over time. However, since I have to make investment decisions today, either to invest or not, I'm going for it and own ZLB. I fully expect that over the long term like 15+ years, ZLB will outperform XIU, ZCN or any cap-weight broad equity ETF by something around 2% before ETF fees. The bona fide academic research supporting the low vol anomaly / risk factor has been around since before the FF 3-factor model even. The low vol anomaly works by avoiding the highest vol (aka beta) stocks. It's just as solid (multiple time periods, many countries, some theory as to why it will continue eg. Betting Against Beta paper, or Eric Falkenstein) as the value factor and probably more so than the small cap factor. However, even with only the same net performance as cap-weight, I am better off because I am in the withdrawal phase of investing when volatility reduction is especially worthwhile. 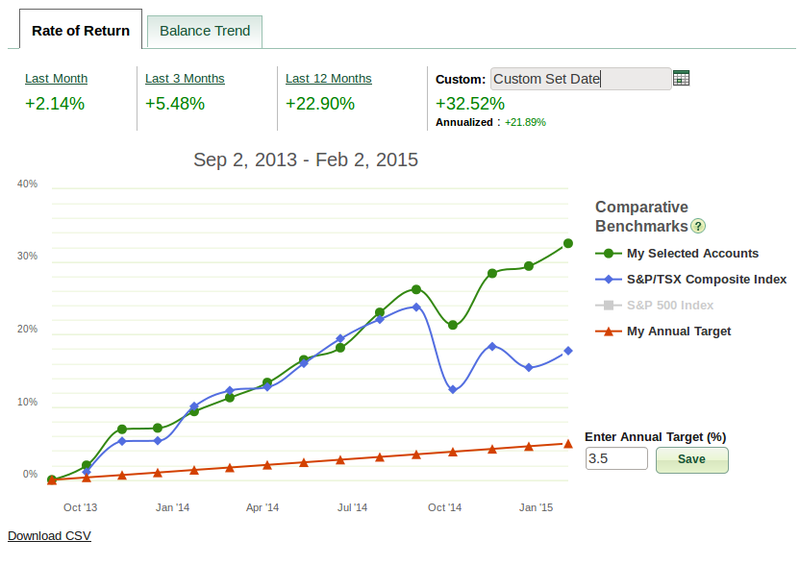 My stock picks are more or less the same since account opening in early 2013 But as you can see the returns chart is only for the past 17 months. In the interim, I sold SNC and CNQ and bought more ZLB. Now my Canadian equity within my total portfolio across this and other accounts is 1/3 each individual stocks, ZLB and PXC.